Feel free to contact us to schedule lessons or instruction. 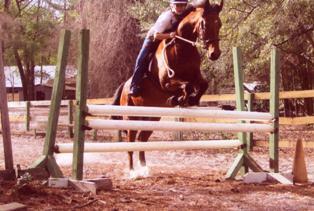 Our Instruction Program focuses on the intent to create a true partnership between horse and human. Such a relationship requires deep, mutual understanding. It is the horse’s nature to read humans, or,’to look into their hearts’. Our method of ‘tell, show, experience’ instruction is geared toward closing the communication gap for the humans. Lessons are $40.00 per hour, and can be purchased below under "More info". On the physical side, we start out with teaching a balanced seat with a method most suitable to the client’s personal abilities. 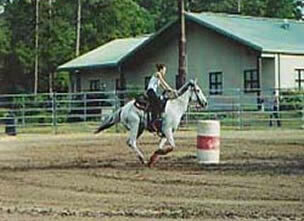 Once this is accomplished, we focus on specific disciplines such as Dressage, Western Jumping, Barrels, or Trail. 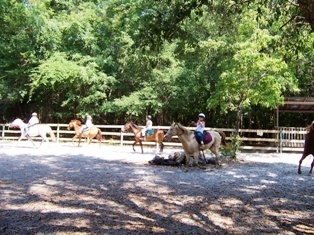 Our school horses come in all sizes; from Miniature horses to Arabians and Quarter horses. Some are suitable for beginners, others for advanced riders only. 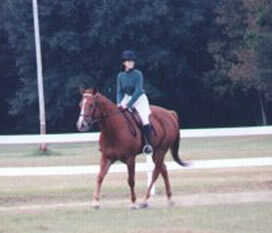 They are ridden both English and Western regularly and have all proven to be reliable mounts with no bad vices.